See! I’m even twirling with joy here! LOL! I really don’t know how the Grinch does it. I mean, how can someone remain so grumpy amidst festive surroundings? With every corner in the city adorned with pretty ornaments, decor and Christmas lights, who wouldn’t catch the Christmas spirit? I actually really wanted to take photos at one of Meralco’s Liwanag parks for this entry. I just came from a campaign shoot (hence the heavy make-up) and wore this as one of my outfits. I thought of it as a great holiday dress so I wanted to look all Christmas-y for this outfit post. It would’ve been nice to have the park as my backdrop–full of Christmas lights and decor. If you haven’t heard about these parks, Liwanag Parks are built by Meralco as part of their signature Christmas campaign called “Maliwanag ang Pasko”. It has been helping charitable institutions since 2006. And this year, the campaign has grown bigger and brighter with the help of Department of Tourism, creating more Liwanag Parks and positioning the Philippines as a Christmas destination. What I love most about this campaign is it’s not just about the Christmas decorations, “Maliwanag Ang Pasko” also enjoins Meralco customers to help energize island schools in Quezon, Palawan, Bohol and Dinagat Islands just by uploading photos of a lighted house or any of the Liwanag Parks on Maliwanag Ang Pasko’s Facebook app. In doing so, Meralco customers like you and me can also get a chance to win Php5,000 daily! Sigh, if only I wasn’t in a rush, I would’ve really loved to go to a Liwanag Park. If you want to help out and are interested to help the campaign or simple want to win PhP5000, drop by a Liwanag Park, take a photo there and upload it on Maliwanag Ang Pasko’s Facebook app. Liwanag Parks are located at the following areas: Meralco Compound in Ortigas, Bacoor in Cavite; Baliuag, Bulacan, Angat, San Rafael, Sta. Maria and Plaridel in Bulacan; Baras, Binangonan, Angono, Antipolo and Jala-jala in Rizal; Batangas City; Bulacan; Cavite City; Cabuyao City; Carmona in Cavite; Dolores in Quezon; Eastwood City; Quezon City; San Juan; Filinvest City Promenade in Alabang; Malabon; Marikina; Mowelfund in San Juan; Nagcarlan in Laguna; Pasig; Pateros; Pila in Laguna; SM Mall of Asia Arcade and Taguig. Anyway, as I was saying, this is a great example of the perfect dress for the holidays. It’s simple yet striking. It’s classy and conservative enough for family gatherings but at the same time, modern and sassy enough for a get-together with friends. Since this dress is predominantly white, I wanted to add a little color through my accessories to make it look a bit more festive. Emerald is the color for next year so why not start a little earlier than the rest? I’ve always loved emerald accessories. They look so sophisticated and opulent. Lakas maka-class! I’ve been browsing your blog since then but this time can’t control my self but express how i love your attire on this! Keep inspiring us with your fresh fashion ideas…More power!!!! im going to the philippines soon and i was just wondering if you could suggest some cool markets/shopping centres/shops to go to while im there. p.s you have such an amazing sense of styleee! 16 naman talaga ako hahaha :) Thanks Tricia! Ms. Camille you look so great. love your taste. cheers!!!! White and Gold is always classy and very elegant. I had this combo during the holiday party I attended in Manila. I like your dress. 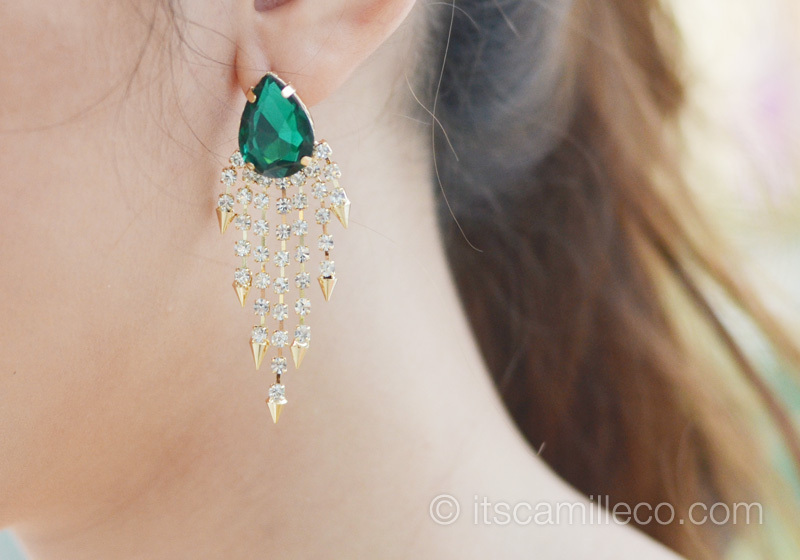 Very simple and blends perfectly with the emerald accessories. Awww maybe I just haven’t approved them yet :) Happy holidays Charisse! Gorgeous !!! Merry Christmas to you ! Thanks Laura! Merry Christmas to you too! Love emerald! :) Thanks Isa! Thanks Gladys! :) I wonder myself too! Really perfect holiday look and feel! I support Liwanag Parks too! Love the entire look here as well! The dress, the makeup, the shoes … everything! My, that dress is gorgeous! You look amazing as always! Super love the outfit and the make-up, its suits you. Its really perfect for holidays party. You give me an idea what to wear in our year-end party. Thank you for always inspiring me. Happy holiday Miss Cams. Godbless you. Love the eyes. Who did it? wow! !miss camille…u look stunningly beautiful!how i wish i can meet u personally (that’s one of my xmas gift)…ehehehe…anyway, i really love ur taste in fashion…i so admire u and u’re one of my inspiration when it comes to dressing up… =) happy holidays in advance! Happy holidays July! :)Thank you! Lo and behold, an angel has descended from the heavens to bring Christmas tidings amidst the murmurings of the apocalypse! Oh, wait.. It’s just Camille Co in full on Christmas bloom! EVEN BETTER!! hahaha!! Merry Christmas and happy Holidays to your family! :) Bring home Bee Cheng Hiang!! Shengdan Kuaile!! Naks naman! Now I’m an angel haha! Thanks Mark! Merry Christmas! i love your makeup – it suits you! Happy holidays to you too! Thanks Paola! Thank you Bianx! I’m happy you’re more open to try new styles now. :) Maybe your comment is still awaiting my approval. I reply to all unless for some weird reason, I accidentally deleted it. (I hope not) thanks again Bianx! wow! your make up is very DARING! but it suits you anyway :) hahaha! Ms. Camille, happy holidays! :) I’m so happy I can read your blog every day now since it’s Christmas break! I love that you’re so excited for Christmas like a kid! You’re so youthful as always! WOOOOOW, stop, your too beautiful. ate Cams, i really love your smile, seeing you like that makes my day complete! :) your outfit is simple and classy. Thanks RA! Sorry I was late! Awww thanks Kim! :) Okay lang yan! I’m sure you look fine! Thanks Moriela! ) Dali! Ilabas na ang mga emerald! Can I just say how stunning that earrings are? And, they look more stunning when you wore it and paired it with that oh-so beautiful dress, Ms. Camille! I love how playful you are on your photos! It’s what Christmas does to me! :) Haha! Thanks Joreina! So pretty and I love the shoes! Such a pretty dress and photos!! In love with your dress! I wanna grab it. So pretty!!!!!!!!!!!!! Love your accessories! They all look so mamahalin! Parang di SM accessories! Especially the earrings! ;) Pwede ng Cartier, Harry Winston o kaya Lorraine Schwartz!